Photo by Bob Ettinger | Michaelina Terranova of Jackson-Milton reacts after setting a school record in the 100-meter hurdles. 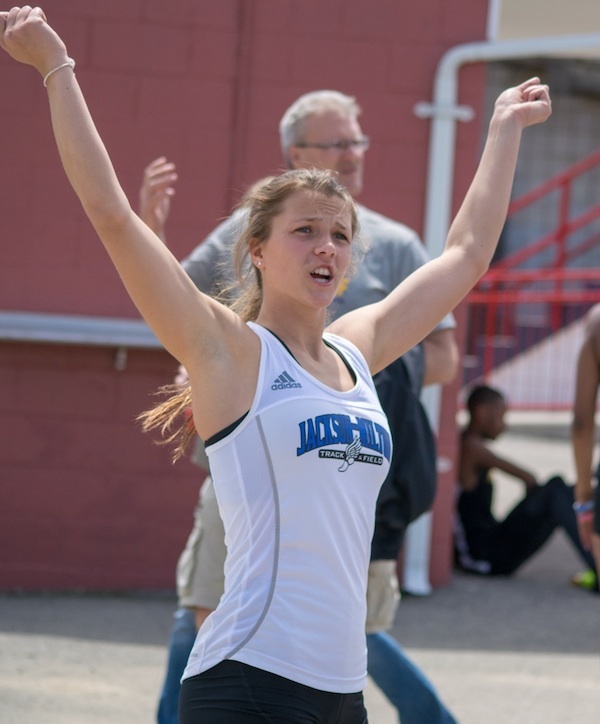 She was second in the event and won the 300 hurdles at the Optimist Meet on Saturday at Austintown Fitch’s Greenwood Chevrolet Falcon Stadium. Michaelina Terranova’s biggest challenge had been herself so far this season. That was until the 38th annual Optimist Meet at Greenwood Chevrolet Falcon Stadium on Saturday. The Jackson-Milton senior rose to the occasion, winning one event and setting a school record in finishing as the runner-up in another. Terranova won the 300-meter hurdles in 46.63 and broke her own school record in taking second in the 100 hurdles in 15.45. Austintown Fitch claimed the boys team title with 80.5 points. Anthony Caulton, Tyrese Bandy, Drew Bretsik and Ralph Fitzgerald took home championships in the 400 and 800 relays while Bandy finished the 200 dash in 22.21 to claim a win. “We were finally able to put those two relays together and run the way we are capable of,” Steiner said. Jakari Lumsden was second in the high jump while teammate Deondre McKeever was third for Fitch. The Fitch girls were second to Twinsburg’s 98 points with 67 of their own. Raegan Burkey of Boardman came from about 15 meters behind Minerva’s Sarah Carver to claim victory in the 800 run in just her second competition competing in the event. Lauren Dolak of Fitch battled some foot pain to win the 1,600-meter run. Khala Cameron claimed a title in the long jump while Madison Skelly won the pole vault for the Falcons. Canfield’s Giovanni Copploe took the win in the 1,600 and Zach Gray of McDonald won the shot put. Caitlyn Marx of Salem won the discus and Izzy Kline of Newton Falls won the shot put. May 2, 2018 12:08 a.m.
May 19, 2018 12:09 a.m.
June 4, 2017 12:05 a.m.